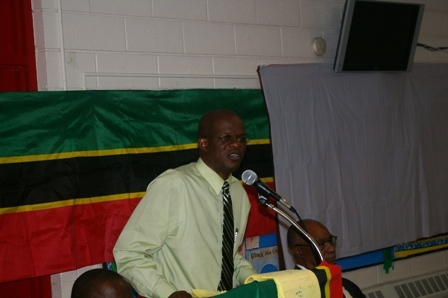 Charlestown, Nevis–(Tuesday, May 10, 2011) The Hon. 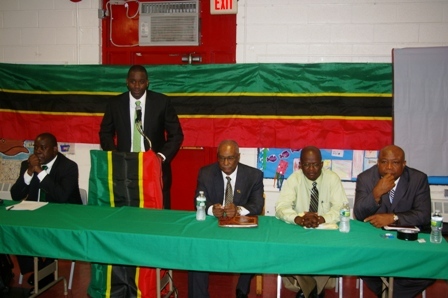 Joseh Parry and members of the Nevis Island Administration visited New York to report on the stewardship of the Nevis Reformation Party (NRP)-led Administration. 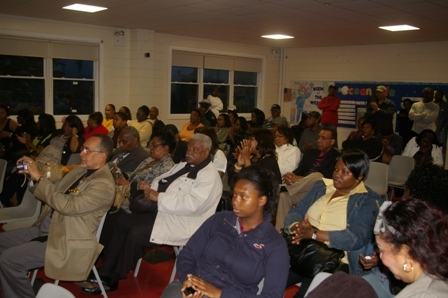 The meeting took place at the St. Andrews Church on Friday evening. The Premier was accompanied by the Attorney General of St .Kitts-Nevis Hon. Patrice Nisbett, Deputy Premier Hon. Hensley Daniel, Advisor to the Premier Mr. Llewellyn Parris and Minister of Housing Hon. Robelto Hector. Mr. Parry said it is very important that Nevisians in the Diaspora understood and supported the various programmes that were undertaken on Nevis in the best interest of the residents. During the meeting, the Hon. Patrice Nisbett discussed his position of Attorney General of St. Kitts-Nevis and the better working relationship between the two islands. He noted that the Prime Minister of St. Kitts-Nevis, the Hon. Dr. Denzel Douglas has shown the political maturity to include a Nevisian in his Federal Cabinet. “I went to Basseterre with the consent of the people who selected me and the party of whom I am a member of and by extension, the people of Nevis, who supported me to go to Basseterre,” said the Attorney General and added, “Some people wanted to go, as much as they criticize… they would have negotiated too. So why can’t I negotiate on behalf of the people?” he questioned. Mr. Nisbett said he has gone to Basseterre and he wanted to be judged on his performance and achievements. The Attorney General pointed to several of his accomplishments since he was appointed to the position including Corporate Taxes which were now being paid to the Nevis Treasury, the One to One Laptop Programme for Fifth and Sixth Form students and the reopening of the Four Seasons Resort-Nevis. Mr. Nisbett noted that when the Hon. Joseph Parry ran into difficulty with the reopening of the Four Seasons Resort, he called on the Attorney General to assist the case in Delaware, USA. “As soon as he called me I summoned one of my senior counsels to assist the case by witnessing and giving evidence on behalf of the people of Nevis. The senior counsel was able to put a human face to the case and inform that the Gross Domestic Product depended greatly on the Four Seasons Resort,” he said. Mr. Nisbett noted that after much evidence the judge understood the hardships and repercussions and allowed a December opening of the Resort and since then over 600 persons have been actively employed there. “As a result of the St. Kitts-Nevis working relationship, the Resort opened. The previous Government brought no major international investment to Nevis for 14 years because many foreign investors did not like the level of instability and acrimony between the two islands,” commented the Attorney General.